Karnataka Vikas Grammena Bank has announced openings for the post of Officers (Scale- I,II,III) and Office Assistant (Multipurpose). 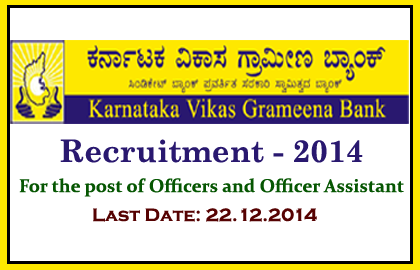 Eligible candidates can apply for this post on or before 22.12.2014. More details regarding this recruitment were mentioned below. Candidates whose who are qualified in RRBs CWE-III held on Sep/Oct 2014 conducted by IBPS can apply for this post. Candidates will be selected on the basis of the marks scored in RRBs CWE-III held in Sep/Oct 2014 conducted by IBPS and Performance in the Personal Interview. Eligible candidates can apply for this post through online by clicking the link given below or from the banks website:www.kvgbank.com. Candidates should mention all the required details in the online application form correctly, editing the application after submitting is not allowed. More details were mention in the link below.